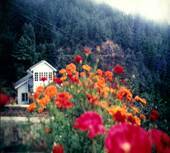 MASHOBRA— About 10 kilometers from Shimla is a quaint little town called Mashobra. Started by the English when they established Shimla, Mashobra has since grown and houses some amazingly beautiful spots that as yet have not been crowded out. To begin with, up the mountain is an enchanting little meadow called “The Talai” by the local inhabitants, and the road leading to this meadow meanders alongside the now rundown estate of the Maharaja of Faridkot. This ramshackle palace houses one of the most incredible collection of vintage cars and motorcycles. Further on the road leads on to a beautiful garden on top of the mountain called Cragnaino. Created by the English, Cragnaino has some rare species of flora. The road then leads on, thru Baldiyan, to India’s oldest nine- hole Golf course, better known as Naldhera. As this place has not been completely taken over by urbanized growth, Mashobra is a lovely place for visitors to stay during their visit to Shimla. 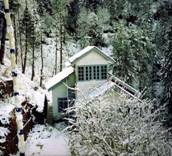 It offers all the benefits of modern day living, with a well-stocked market, eateries, local transport to and from Shimla, etc, and at the same time one can escape the seething crowds that overflow in Shimla during holiday season. Also it is a mere 10 kilometers from Shimla. What we have to offer to the discerning traveler, who is looking to get away from the hustle and bustle of the city, is an exquisite pine cottage, set in an orchard. 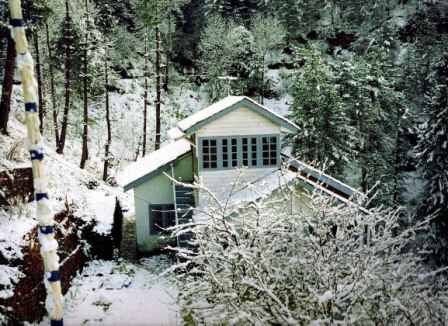 The cottage, known as “Bandargah” or affectionately called “Kaptan Sahib Ka Bageecha” by the locals, is a completely self-contained old world cottage, comprising three bedrooms with attached bathrooms, a living room, a kitchen and a large balcony where one can sit and gaze across the valley at Shimla without actually going there. “Bandargah” is approximately 3.5 kilometers from Mashobra on the main highway towards Naldehra. The cottage nestles in secluded orchard which is surrounded on all sides by pine forests. This cottage is fully furnished, and the kitchen has every modern amenity that one would require including a microwave. There is also a big balcony from were one can watch the glorious sight of a scarlet sky as the sun sets over Shimla. For those who are accompanied by their house-help or drivers, separate accommodation is also available. During the monsoons, standing on the balcony, you can see the clouds slowly roll up the mountain and reach the house, caressing you or just hear the wind whistle through the pines. In fact, the USP of this property is that this place is situated within touching distance of the main market, yet it is totally isolated from any inhabited place. Also it is bang on the main highway with protected parking for cars.